Whenever we have a blend of solvents we need to understand the VLE, Vapour Liquid Equilbria, that tell us what is happening in the vapour phase. 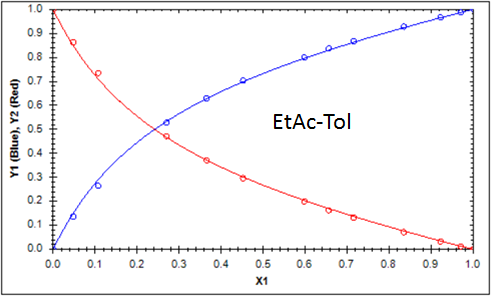 Especially important is whether a given solvent blend will form an azeotrope. Sometimes this is undesirable as it makes it difficult to purify one of the solvents (such as ethanol in water!). 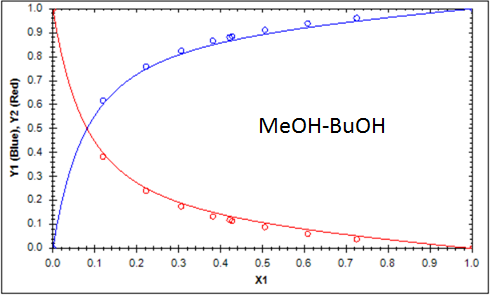 Increasingly it is desirable for the creation of "designer solvents" where HSP are used to optimize the cleaning (or other) capability and where an azeotrope makes it especially easy to recycle the solvent blend. Traditionally those interested in VLE use large packages such as UNIFAC or ASOG. 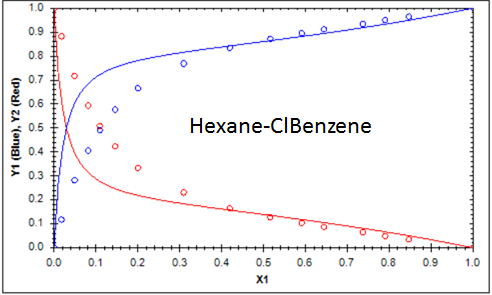 The problem, other than their cost, is that they aren't so great for predicting properties of blends of new solvents. The problem is that such predictions need, in addition to activity coefficients (which the packages do well), boiling points and Antoine constants that these packages are not well set up to create. 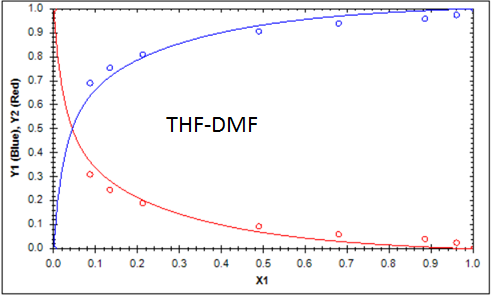 This is where HSPiP's VLE capabilities shows its predictive power because all relevant properties are calculated automatically. You can see the VLE live in the video on the HSPiP Videos page. 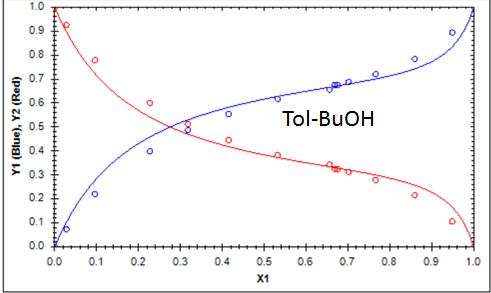 The image shows the VLE curve for toluene/butanol which is a good match to the experimental data points. 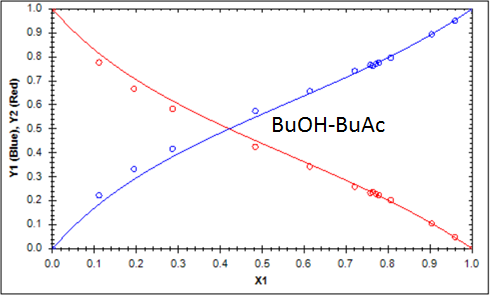 The predicted azeotrope is 102.7°C with 67 mole % butanol. The experimental values are 105.5°C and 67%. The azeotrope will be an interesting solvent with HSP [17.4, 2.7, 6.2]. 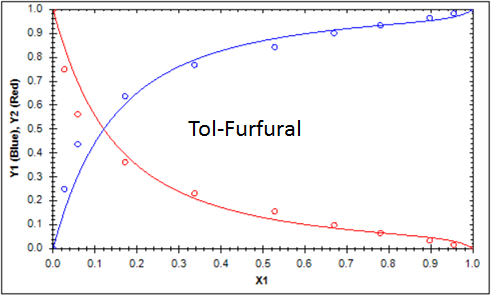 The VLE engine predicts all relevant properties simply from the SMILES strings of the solvents. 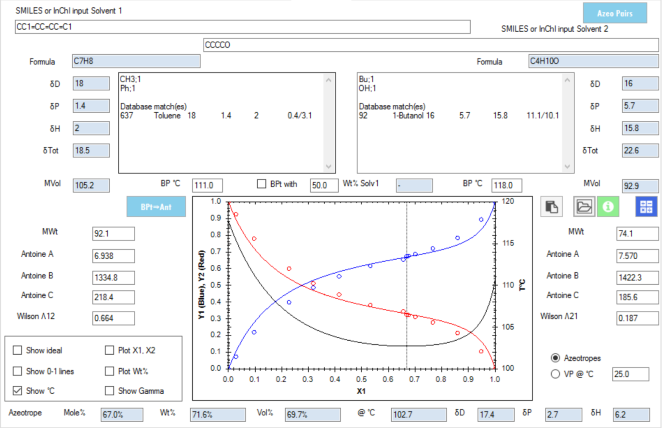 You get BPts, Antoines, MWt, MVol and, of course, Wilson Parameters - all combining to give you a full VLE plot with lots of options beside the classic liquid phase:vapour phase mole fraction plots. 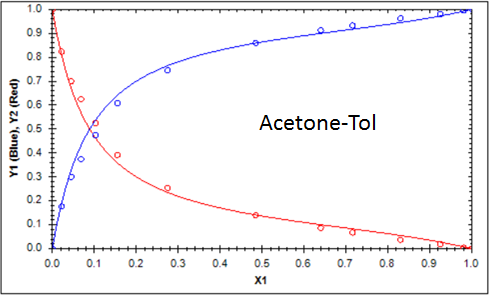 An important part of the engine is that if you happen to know the BPt of a solvent and if the automatic estimate is wrong, the Antoine A constant can be automatically adjusted to give the correct BPt behaviour; this greatly improves the accuracy of the VLE predictions. 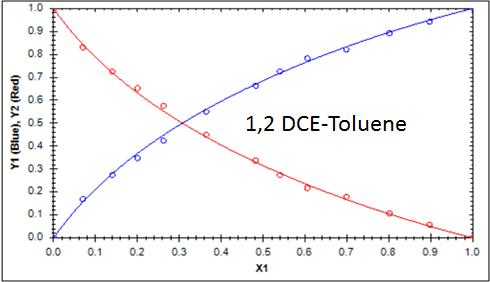 If the VLE predictor recognises that a solvent has an experimental BPt within the Hansen dataset, this is automatically provided for your convenience. You can also take a list of solvents that you might be interested in and click a button to get a list of all the azeotropes from all pairs of solvents. 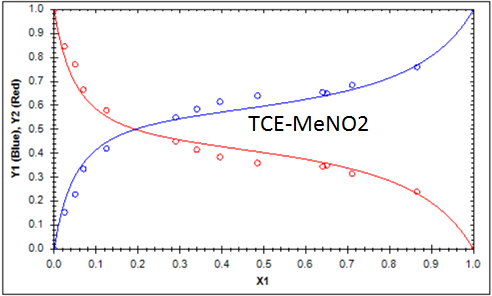 This is true predictive power as you can quickly identify potential azeotropes from solvents that are acceptable (e.g. if the list is of "green" solvents). The VLE predictor also allows you to load experimental data so you can compare predictions to reality. 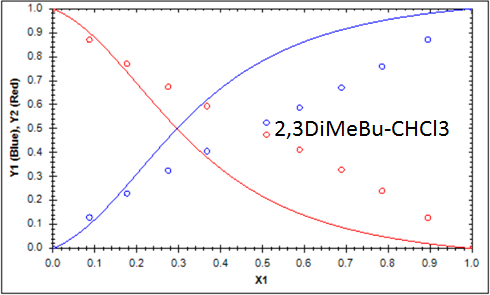 The images below gives you 14 example screen shots from the extensive dataset used to validate the Y-MB VLE engine, showing the VLE prediction (solid lines) and the experimental data points. Most of the fits are rather good. 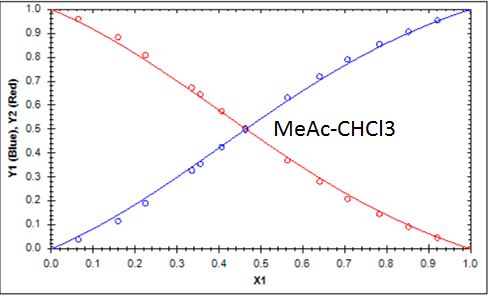 We have excluded some well-known problem sets (such as methanol and acetic acid with specific solvents) which show special "clustering" behaviour that makes their VLE predictions challenging for all packages, not just Y-MB VLE. The few "bad" fits are the focus of our continuing efforts to improve the VLE engine.